Manchester United have made their worst start to an English Premier League season in 27 years. They are already a long way behind leaders Chelsea at the top of the standings, while they have work to do if they are to qualify for Champions League football next season. The Reds were recently held to a 1-1 draw at Old Trafford against West Ham, and as a result are now out to 50/1 with bet365 in the Premier League outright market for the title. Manager Jose Mourinho is not just having problems on the pitch, he has been sent off from the touchline twice already in the campaign and is set for another spell in the stands. 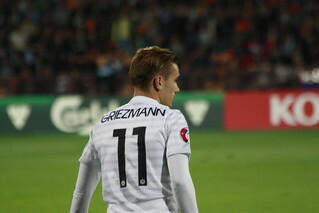 Frenchman Antoine Griezmann has been linked with a move to Old Trafford for a number of transfer windows now. The Atletico forward has scored 66 goals in the last three seasons for his club and has been one of the key reasons why the Spanish club have been able to compete with the likes of local rivals Real Madrid and Barcelona in La Liga and the Champions League. Griezmann was named as the player of the tournament at Euro 2016 last summer where he was also the top goalscorer with nine goals as the hosts reached the final but were beaten by Portugal in extra time. If Mourinho was able to persuade the French international to join his fellow compatriot Paul Pogba at United, it would be a huge coup for the Reds boss. One of the priorities Mourinho will be keen to address as early as possible in his team in his back four. They have leaked goals all season and the injury to Eric Bailly has left them short of real quality in the defensive line. Bonucci is regarded as one of the best defenders on the planet. He has excelled with Juventus in recent seasons and also caught the eye of many at Euro 2016 where he was very solid for Italy. The 29-year-old may cost up to £50 million, but Mourinho may see that as a small price to pay to secure the services of the Italian in January. Croatia international Ivan Rakitic has been linked with a move away from Barcelona in the near future and that is likely to prompt the interested of a flurry of clubs who will be keen to secure his signature. Rakitic joined the Spanish giants in 2014 from Sevilla. In that time he has gone on to win La Liga twice, the Copa del Ray and the Champions League. The busy midfielder can add a real touch of quality to any side in the world. He is exactly the player Mourinho would love to have in the heart of his team. The 28-year-old is not a prolific goalscorer himself but he offers much more than goals and would help transform this struggling United side.